It’s an evening for grown-ups, but it’s all about our kids! 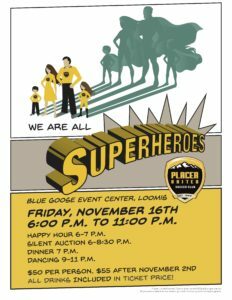 The Placer United Dinner-Dance-Auction brings together our parents, coaches, and staff for an evening of food, fun, and dancing. In addition to offering a night of unparalleled socializing, the highlight of the evening is the fact that our focus is on helping all young players be part of the game—all proceeds raised go back into our youth soccer programs. Party: 6:00 p.m. – 11:00 p.m. Happy Hour: 6:00 p.m. – 7:00 p.m.
Silent Auction: 6:00 p.m. – 8:30 p.m. Dancing 9:00 p.m. – 11:00 p.m.
All food and beverages included in your ticket price! Questions? or Available to help? Contact admin@placerunited.com.